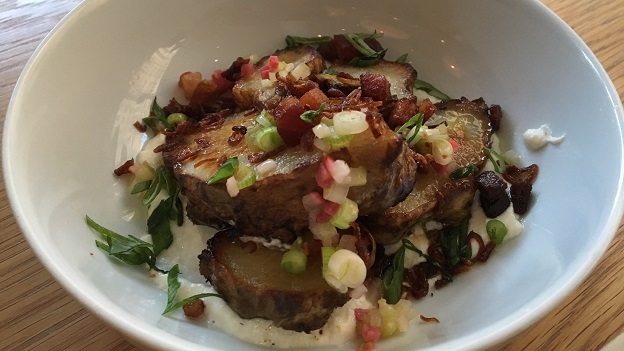 Should you ever hear the phrase “Chef would like to cook for you” at Untitled, there can only be one answer. Yes, please! This dinner prepared by Executive Chef Michael Anthony and Chef de Cuisine Suzanne Cupps was one of the best meals I have had anywhere in a long time. I don’t know where to start with the food. Everything is absolutely delicious. Dinner is served in flights, which gives us a opportunity to sample a sizable amount of the menu. 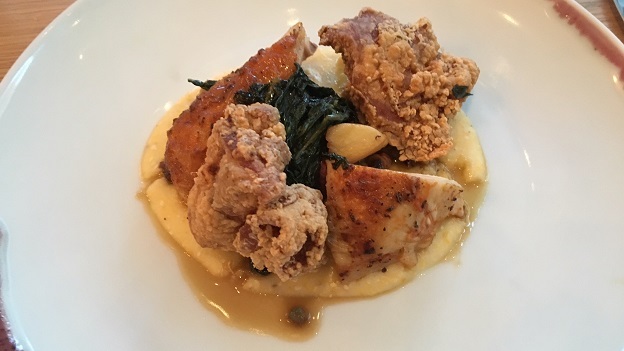 With the exception of the chicken, which is presented as main course for everyone, all the other dishes are devoured by four hungry members of the Vinous team. 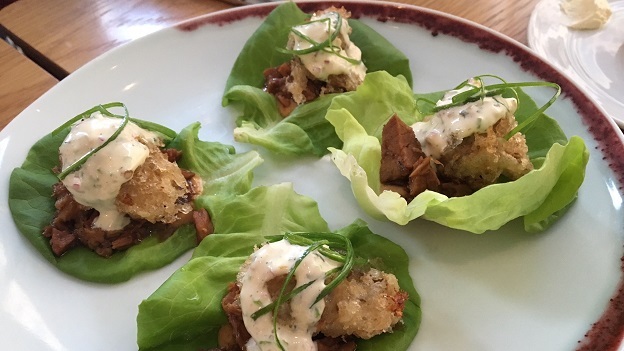 Anthony's pulled pork lettuce wraps with fried oyster and peanut miso are to die for. 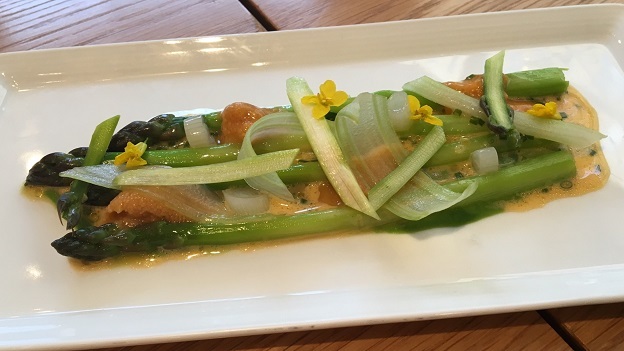 The fingerling potato salad with yuzu and charred ramps is also of note, as is the asparagus with spring onion and sea urchin. By the time the chicken arrives, I am happy not to have to share it. But what really stands out is a kind of clarity that only comes with working with the very best ingredients. The common thread in all of Anthony's food is extreme freshness and vibrancy. Desserts are just as brilliant as everything else on the menu. I can't think of anything we had that I would not gladly order again. The 2014 Lignier Bourgogne Aligoté is great reminder of just how delicious these wines can be, especially in the right setting. Crisp and refreshing, with plenty of lemon/grapefruit overtones. the 2014 was an ideal aperitif for a warm, spring night. Vincent Dauvissat’s 2005 Chablis Les Clos is in a gorgeous sweet spot, with striking complexity that has developed in bottle but plenty of life ahead. The rich, viscous signatures of Clos with a little age match perfectly with a number of courses. The lemon confit, chamomile and apricot notes are viscous and textured, but never heavy. If well-stored, the 2005 will probably drink well for another 10-15 years, perhaps longer. Tonight it is exceptional. 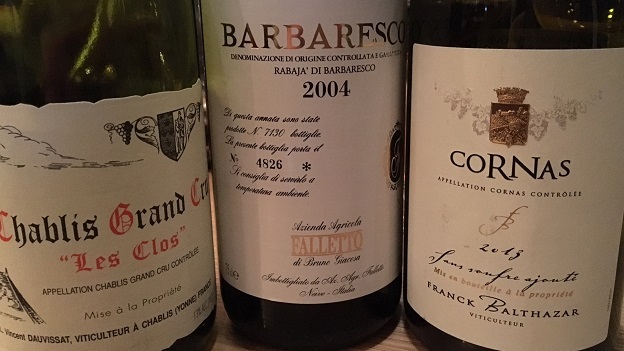 Unfortunately, we do not have very good luck with Bruno Giacosa’s 2004 Barbaresco Rabajà. A bottle about six months before was absolutely stellar. That is not the case on this night. The 2004 Rabajà totally lifeless. These are the most dangerous bottles, because they aren’t obviously corked and yet they are definitely tainted. Franck Balthazar’s 2013 Cornas Sans Soufre Ajouté takes things in a much more positive direction. The pungent dark cherry, olive and herb flavors are really popping. Although not especially complex, the 2013 over delivers in the pleasure department. What a gorgeous wine. Beverage Director Eduardo Porto Carreiro has a number of gems on his small, well-chosen list. This is one of them. In 2015, the Whitney Museum of American Art moved to its new Renzo Piano-designed building in the Meatpacking District, which I still remember in less glorious times. The combination of new location, the vibrant scene on the terrace at the end of the afternoon and the fabulous food at Untitled all add up to a very pleasurable way to spend a few hours in New York. I can’t recommend Untitled highly enough.